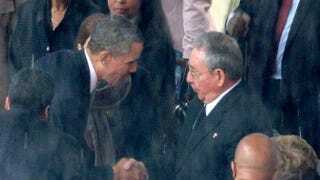 President Barack Obama shakes hands with Cuban President Raúl Castro during the official memorial service for former South African President Nelson Mandela at FNB Stadium Dec. 10, 2013, in Johannesburg. In a historic move, replete with Republican controversy, the president announced on Wednesday that he is looking to ease up on sanctions—including economic and travel restrictions—against Cuba, effectively ending a 50-year diplomatic freeze with the communist nation, according to CBS News. "I believe we can do more to support the Cuban people and our values through engagement," President Obama said from the White House. "These 50 years have shown that isolation has not worked. It's time for a new approach." The breakthrough came Tuesday after a phone call between Obama and Cuban President Raúl Castro, which, according to CBS News, was "the first engagement at the presidential level between Cuba and the United States since the Cuban revolution." According to the news site, the two leaders discussed brokering a deal that released three Cuban intelligence officers from American custody for the release of American prisoners Alan Gross and another man described only as a "U.S. intelligence asset." Both leaders have agreed to the deal, according to the news site, and the supposed good-faith negotiations of releasing the prisoners will be the first step in "potential cooperation between the two nations," CBS News reports. According to the news site, "The U.S. and Cuba will immediately begin discussions to re-establish diplomatic relations, including plans to establish an embassy in Havana." The president acknowledged that the U.S. has a "complicated history" with the communist nation but added, "Neither the American nor Cuban people are well served by a rigid policy that’s rooted in events that took place before most of us were born." Republicans were quick to criticize the president's actions. Sen. Bob Menendez (D-N.J.) cautioned that the exchange of " … Mr. Gross for three convicted criminals sets an extremely dangerous precedent." Sen. Marco Rubio (R-Fla.) said that Barack Obama "is the single worst negotiator we have had in the White House in my lifetime." CBS News notes that while Wednesday's announcement is historic, the two nations have worked together in the past, most recently during the Ebola outbreak in West Africa, where Cuba was one of the first countries to send doctors to help fight the spread of the deadly virus. "Todos somos americanos," Obama said during his speech. "Today America chooses to cut loose the shackles of the past so as to reach for a better future for the Cuban people, for the American people, for our entire hemisphere and for the world." Watch the video at CBS News and read the complete transcript at Whitehouse.gov.